According to an inscription on the back of the drawing, Marquis de Gouvernet (sale, Paris, 6-10 November 1775); purchased by Conseiller Nourri (sale, Paris, 24 February-14 March 1785); purchased by Conseiller de Saint-Maurice (sale, Paris, 1 February 1786). George Fenwick-Owen, Lether Melton (purchased in a mixed lot at Sotheby's in about 1930); Mrs. Denise Fenwick-Owen, London (sale, Sotheby's, London, 27 March 1969, no. 86); NGA purchase via Thomas Agnew & Sons, London, in 1969. NGA Master Drawings 1978, p. 63. 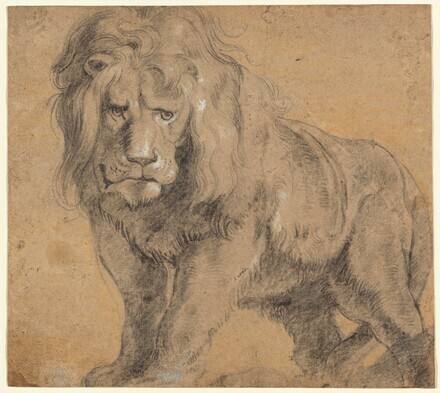 Flemish Drawings in the Age of Rubens: Selected Works from American Collections, The Cleveland Museum of Art, 1994, no. 44. A Collector's Cabinet, National Gallery of Art, Washington, 1998, no. 74. Cott, Perry B. "The Ailsa Mellon Bruce Gifts." The Connoisseur178, no. 718 (1971): 253. King, Marian. Adventures in Art: National Gallery of Art, Washington, D.C. New York, 1978: 44-45, pl. 22. Walker, John. National Gallery of Art, Washington. Rev. ed. New York, 1984: 671, no. 1066, color repro. Mittler, Gene A. Art in Focus. Peoria, 1986: 253, fig. 14.10. Southgate, M. Therese. The Art of JAMA: One Hundred Covers and Essays from The Journal of the American Medical Association. St. Louis, 1997: 80-81, color repro. Wheelock, Arthur K., Jr. A Collector's Cabinet. Exh. cat. National Gallery of Art, Washington, 1998: no. 74. Mittler, Gene A. and James D. Howze. Creating and Understanding Drawings. New York, 2001: 78-9. Mayhew, Timothy David, Margo Ellis, and Supapan Seraphin. "Natural Black Chalk in Traditional Old Master Drawings." Journal of the American Institute for Conservation 49, no. 2 (Fall/Winter 2010): 85, fig. 2 (color; also reproduced on the cover).